What is it About Legumes and Pulses? It is an exciting time for legumes. They are appearing in every ‘top 10 nutrition trends’ list you see and have a lot to gain from the increasing popularity of plant protein. Products made with ingredients like chickpea flour or faba bean protein are becoming common sights at industry trade shows and store shelves. 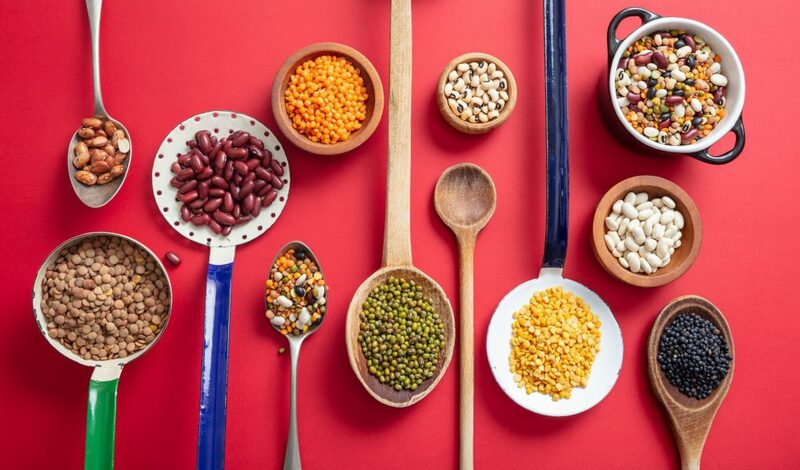 The secret to the popularity of legumes lies in their ability to satisfy a few of the highest-demand traits in food and beverage right now: nutrition, sustainability, and flexibility in formulation. 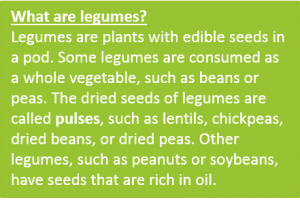 Legumes are one of the most naturally well-rounded foods in the world from a nutritional perspective, containing a variety of vitamins and minerals, as well as protein and fiber. This nutrition profile helps them fit 5 (Digestive Wellness, Plant-based, Good Carbs Bad Carbs, Protein, and Snackification) of the top 10 Key Health and Nutrition Trends for 2018! The 2015 Dietary Guidelines for Americans state that calcium, fiber, iron, potassium, and vitamin D are nutrients of concern for under-consumption in the United States. Kidney beans provide fiber (29% of Daily Value, or DV, per serving), calcium (8%), iron (11%), and potassium (11%) while also providing B vitamins and zinc. Legumes are also naturally low in sodium and saturated fat, which are nutrients the Dietary Guidelines for Americans list as a concern for overconsumption in the United States. In addition, consuming legumes is associated with reduced risk of type 2 diabetes, cardiovascular disease, and some cancers. It’s amazing to think that one type of food naturally addresses so many public health concerns. It should be no surprise, then, that legumes are included in all dietary guidelines worldwide. In fact, the Eatwell Guide in the UK even recommends we replace some meats in our diet with vegetable protein sources like legumes. In addition to their rich nutrient content, legumes are one of the most environmentally sustainable sources of protein. They can draw nitrogen from the air, rather than from the soil, meaning they do not require fertilizers. In fact, growing legumes increases the nitrogen content of soil and feeds soil microbes, improving soil quality for subsequent crop growth. They also require significantly less water than other protein sources; it only takes 43 gallons (195 litres) of water to produce a pound of pulses. 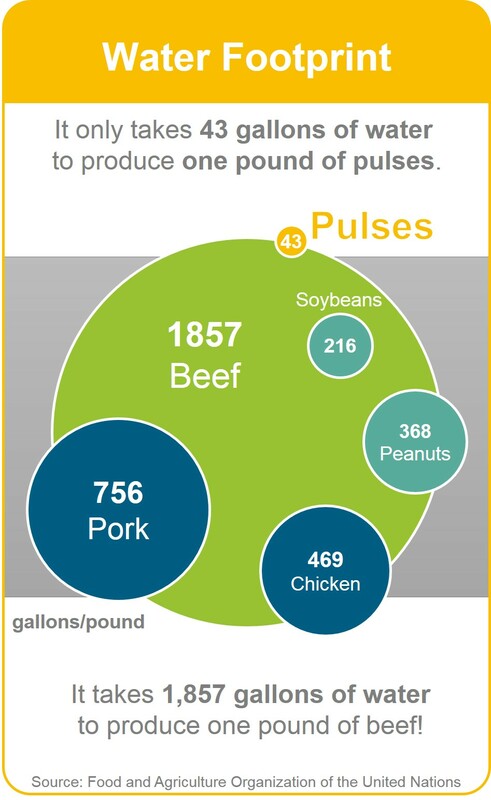 To put this in perspective, it takes 1,857 gallons (8,442 litres) of water to produce a pound of beef and 469 gallons (2,132 litres) to produce a pound of chicken. Finally, producing legumes results in a fraction of the greenhouse gas emissions compared to protein sources such as beef or poultry. For more resources on pulses, head to the FAO’s website on the International Year of the Pulse. New processing technologies bring ever-increasing flexibility for legumes as ingredients in food. Hummus is a great example of the opportunity for legumes in the marketplace, which has massively grown in popularity in recent years; according to a 2015 Mintel Report on Sweet and Savory Spreads, hummus sales totaled $5 million annually 15 years ago but is projected to be a billion dollar industry by 2022. To this point in time, soy has been the dominant legume around the world. It is found in over 50% of legume-containing products globally (Pulses and Legumes Ingredient Insight, Mintel 2017). However, many other types of legumes are stepping into the spotlight. Percentage change of pulse and/or legume ingredients penetration in global food and drink launches, by top 10 pulse ingredients, February 2012– January 2017. Pulses and Legumes Ingredients Insight, Mintel 2017. Other examples of protein-rich legume snacks include pea crisps, lentil crackers, plant protein powders and roasted bean mixes. The versatility of legumes has allowed them to penetrate nearly every product category (Mintel 2017). Vegan eggs made from mung bean, cheese made from cashews, or nacho cheese dip made with chickpea flour are just some examples of the breadth of innovation coming down the pipeline for legumes. Percentage of pulse and/or legume-containing food and drink launches, by category, global, February 2012 – January 2017. Pulses and Legumes Ingredient Insight, Mintel 2017. Although legumes are nutritionally rich and consumers are seeking what they have to offer, the true challenge may lie in developing legume-containing products that consumers want to eat. Legumes have unique and distinct flavors and cannot be used in all applications. Finding the right application is a challenge and a potential opportunity for product developers. Some examples of how developers can improve flavors are shown on our Application of Flavour page. Since each legume is unique in its macronutrient composition (example: chickpeas are 6% fat by weight, but black beans are only 1.5%), cooking and processing has to be tailored for each legume. Processing and cooking the legumes to produce the best product (taste and texture) while maintaining whole piece identity requires control and balance. In addition to maintaining piece identity, the nutritional benefit of the legume itself must also be maintained. For example, frying legumes would produce a very tasty and good textured product, but the process will add calories. Even though legumes are high in protein, their PDCAAS values (a measure of protein quality) are not comparable to animal proteins, with the exception of soybeans. A diet of legumes and cereal combinations will improve the quality of the protein. Despite these challenges, we can expect to see a variety of legume innovations entering the marketplace in response to the momentum legumes are gaining with consumers. Nathan Pratt, PhD, RD completed his doctoral studies at the University of Illinois at Urbana-Champaign, where his research focused on weight management, nutrition labeling, and consumer behavior. He joined Kerry’s nutrition team in 2016 is responsible for supporting internal and external scientific communications. Wiwid Paramita, Phd has worked with numerous technology platforms including snacks, cereals, nutrition, seasonings, and meats over her 15+ year long career as a food scientist. Wiwid completed her MS and PhD in food science and is an avid orchid enthusiast.